The James and Margaret Mudd Teacher Recognition Scholarship at Truman provides graduating students with the opportunity to honor an outstanding high school teacher who made a transforming impact in their life. Click here to nominate a teacher. A selection committee will review nominations and determine a winner. The chosen teacher will be invited to participate in spring commencement and will be recognized formally during the commencement program. 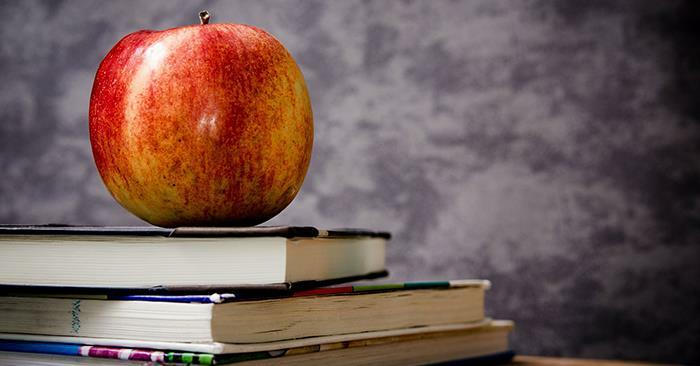 To further honor the selected teacher, a scholarship in the amount of $1,000 will be awarded to an incoming Truman student from the selected teacher’s high school. Nominations are due by Feb. 13. 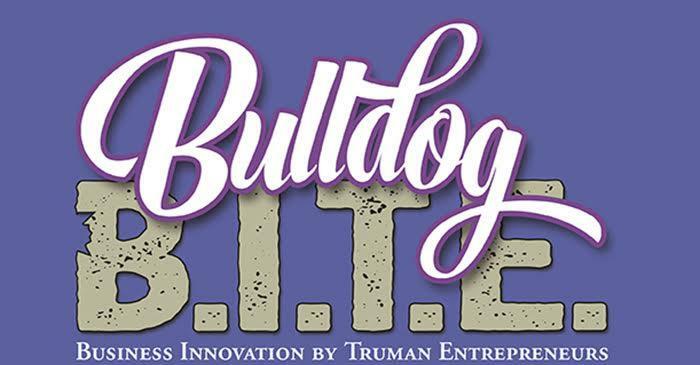 The James and Margaret Mudd Teacher Recognition Scholarship is made possible through generous gifts to the Truman State University Foundation. Jessica Colpoys, assistant professor of animal science, will serve as the director for the Office of Student Research for a three-year appointment, effective May 1, 2018. In addition to teaching courses in the Agricultural Science Department, Colpoys conducts research on animal production, behavior and welfare. She completed her Ph.D. in animal physiology at Iowa State University focusing on swine feed efficiency, behavior and welfare. Colpoys will work with Chad Montgomery, the current OSR director, during the spring semester to allow for a smooth transition in leadership. The OSR serves as a central resource for student research, scholarship and creative activities at Truman. It helps promote, facilitate and provide access to faculty-mentored student research across all disciplines. The OSR supports research at Truman in four areas: academic year research; summer research; external funding and grants support; publication, presentations and publicity. 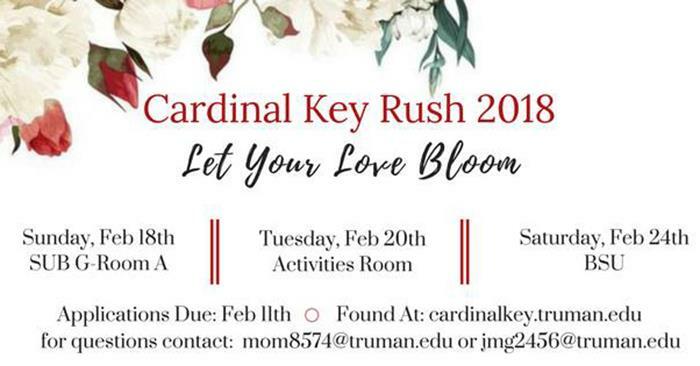 For more information, visit osr.truman.edu. Truman students, faculty and staff are now able to mail their personal packages through Campus Mail Services, located in the General Service Building. The mail service has the same standards as the United States Postal Service, and packages can be mailed for lower than the USPS retail rate. Prior to drop off, packages must be sealed and ready to be mailed. Only packages will be accepted, no letters or flats up to 13 ounces. First class packages, priority mail, express mail and international packages will be accepted between 12 p.m. and 3 p.m. Monday-Friday. Packages will be processed, and a tracking number will be issued. Payment can be done by credit or debit card only. Stamps will not be sold at Campus Mail Services but can be purchased at the cashier window in McClain or at each of the resident hall front desks. Packages must be brought by the individual who is mailing the package. A small convenience fee of 10 percent will be added to the total when the item is processed. 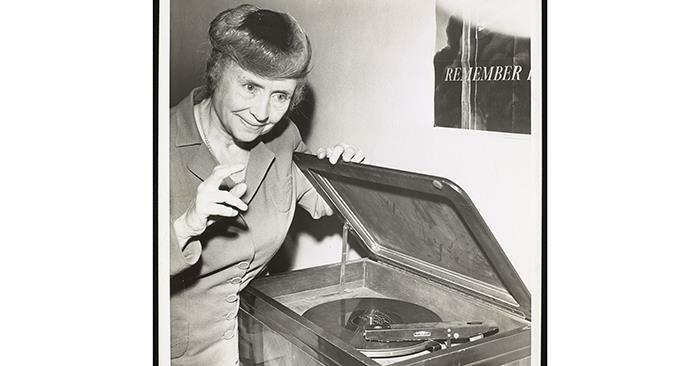 Helen Keller, dressed in a formal dark colored suit and hat, stands next to a phonograph at the AFB headquarters in New York, N.Y. Her left hand is placed on the top of the phonograph and her right hand is poised in the air. Circa 1944. Copyright © American Foundation for the Blind, Helen Keller Archive. President Sue Thomas will give a State of the University address, which will focus on the state budget recommendation for next year. A webcast of the remarks will be made available shortly after. Phi Beta Lambda will host their second open meeting 6-7:30 p.m. Feb. 12 in Violette Hall 1146. The meeting will offer a workshop on resumes and cover letters presented by Jenni Nuhn from the Career Center. 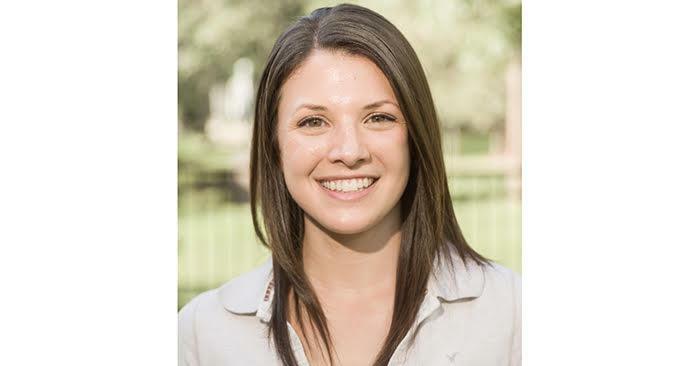 Nuhn is a Truman alumna and has spent several years in human resources reviewing applications and job candidates. This workshop will give students the chance to have their applications reviewed prior to Career Week. Anyone on campus is welcome to any two PBL workshops per semester. PBL is the career prep organization on-campus. They assist members in broadening their perspectives on different lines of employment, gaining transferable skills and developing leadership. For more information, email pbltruman@gmail.com. 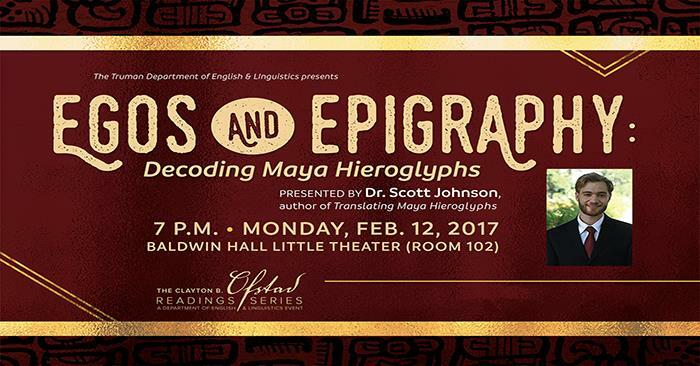 Scott Johnson, author of “Translating Maya Hieroglyphs,” will present a Clayton B. Ofstad lecture entitled “Egos and Epigraphy: Deciphering Maya Hieroglyphs” at 7 p.m. Feb. 12 in Baldwin Hall Little Theater. The talk will include the perspective of dozens of scholars, priests and characters in the history of the decipherment of Maya hieroglyphics. The story starts shortly after European colonization of Yucatan, Mexico, travels through Berlin at the end of World War II and culminates during the Cold War when scholars attacked each other’s ideologies instead of assessing the merits of their ideas. Today, Maya hieroglyphics are a complex writing system that is still not fully understood. The talk, which is free and open to the public, will conclude with the discussion of debated controversies in the field. Johnson is an archeologist with broad interests including experimental archeology, writing systems, ethnoarchaeology, linguistics and field methods. Since receiving his Ph.D. from Tulane in 2012, he has continued to do fieldwork in the Yucatan, directing the Emal Archaeological Project for several years, and has taught courses at Washington University in St. Louis. He is the director of the non-profit Low Technology Institute, which seeks to revive and adapt ancient technologies to solve problems today. Due to the generosity and vision of Odessa Ofstad in creating the Clayton B. Ofstad Endowed Chair in English and Linguistics, the Department of English and Linguistics is able to offer a range of intensive seminars, masterclasses and workshops in creative writing, English and linguistics led by guest writers and scholars. Along with these classes, the Clayton B. Ofstad Reading Series, which features these guests, has become a centerpiece of departmental and campus culture. 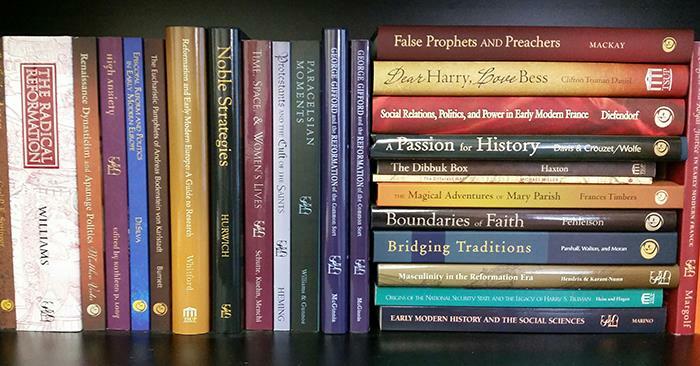 The Truman State University Press will host a book sale 10 a.m.-3 p.m. Feb. 12, 13 and 16 in the Student Union Building. The sale will include discounts up to 50 percent off. TSUP publishes poetry, contemporary nonfiction/memoir and books of regional interest. The Truman Upward Bound project is currently seeking instructors, residential mentors, a night monitor and a photographer to work with area high school students while they are participating in a six-week on-campus college simulation. This paid position provides a high-impact learning experience that will help upper level Truman students gain valuable on the job training, build their resume and develop non-cognitive skills necessary for future employment. Applications can be filled out under the employment opportunities link at ub.truman.edu. 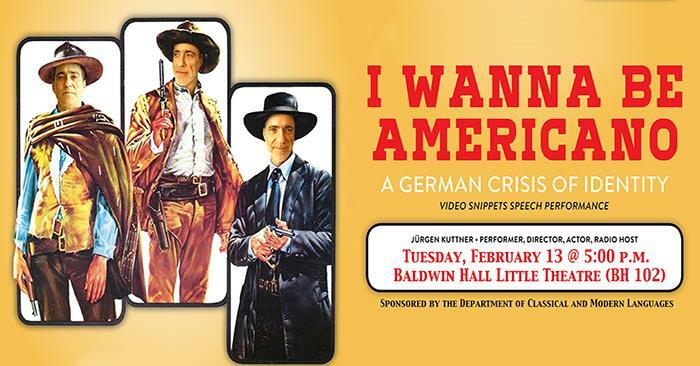 German radio personality, actor and theater director Jürgen Kuttner will present his celebrated video-clip performance, “I Wanna Be Americano: A German Crisis of Identity,” at 5 p.m. Feb. 13 in Baldwin Hall Little Theater. Kuttner came into national prominence in the 1990s as a radio host in Berlin and Bradenburg. He is known for his work in theater, most notably for his monthly video-clip evenings at the Berlin Volksbühne Theater during which he offers critical commentary on video-clips in a rapid-fire Berlin accent. In addition to his solo performances, Kuttner has collaborated with theater director Tom Kühnel on several recent productions at the Deutsches Theater in Berlin, which include adaptations of the work of Bertolt Brecht, Ayn Rand and Valerie Solanas. Kuttner is visiting Truman as part of his tour of the United States sponsored by Dickinson College. His visit to Truman is sponsored by the Department of Classical and Modern Languages. The Writing Center will be hosting workshops to help students reduce and manage writing-related anxiety and stress. The Better Writing Workshops will take place once a week and are free. The workshops will be low intensity and consist of small groups of five to seven people. Interested students can email write@truman.edu. A schedule will be made based on the number of workshop groups that are needed. Presentation abstract: The immediate cost of climate change in the coin of human suffering is unmistakable: from heat stroke and starvation in the wake of record-breaking global temperatures and droughts to drownings in flash floods and ever-more energetic tsunamis, the line of direct causality is clear. However, the effects of global warming are not limited to simple, first-order cause-effect relationships. What is not widely recognized is the hand of climate change in our world’s increasingly unstable geopolitics, or the degree to which these chains of indirect causality can extend over time. Failed crops in one growing season can displace whole populations, destabilize countries, fuel resistance movements and drive international politics in the years to follow. This presentation will explore the central role of climate change in the global refugee crisis. More information can be found by following the event on Facebook. Truman, newly in partnership with Edge Hill University, offers a unique opportunity for students to study abroad in England. Located in the northwest town of Ormskirk, this historic market town, with an interesting array of shops and restaurants, still retains the friendly atmosphere characteristic of rural England. Only a short distance from seaside towns or cities such as Liverpool and Manchester, it also provides an ideal location for travel in other parts of England, the U.K. and the rest of Europe. The region offers opportunities for a wide range of cultural and leisure pursuits including live music, theatre, sports, cinema, walking, the arts or shopping. All students are entitled to become members of the Students’ Union with access to all facilities, activities, clubs and events on campus. Courses are available in business, media, computer science, English, history and more. 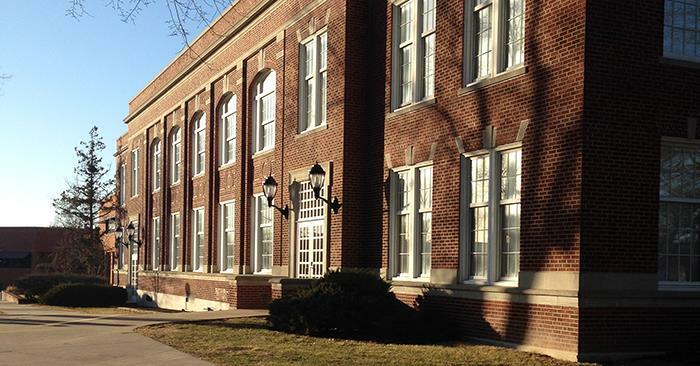 Being an exchange program, students pay tuition directly to Truman. This makes payment easy and affordable. Students are responsible for arranging and paying Edge Hill University for all housing costs. Edge Hill University provides beautiful and convenient on campus housing through resident halls as well as a meal plan that provides up to 12 meals per week. For more information on Edge Hill University, visit ccisabroad.org/programs/edge-hill-university- england. To apply, fill out a Truman online application and send a statement of purpose, official transcripts, a copy of passport and two letters of recommendation to the Study Abroad Office in Baldwin Hall 106. For more information, contact the Center for International Education Abroad, Baldwin Hall 106, 660.785.4076, ciea@truman.edu. 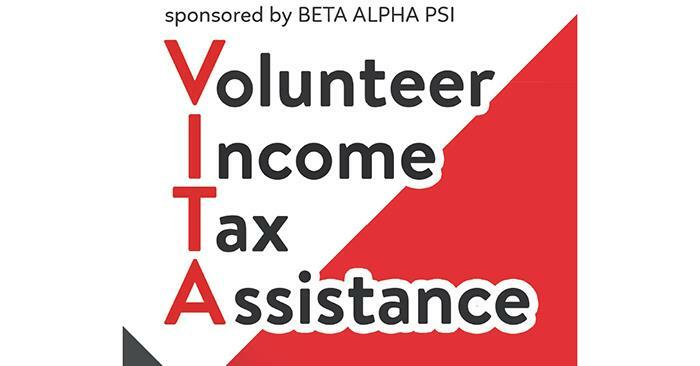 Truman’s chapter of Beta Alpha Psi will again conduct Volunteer Income Tax Assistance (VITA) sessions in February and March. The VITA program provides free income tax assistance to students and the community. All volunteers are IRS certified, and most returns qualify for electronic filing for a faster return. Truman students and employees and Sodexo employees will be accepted on a walk-in basis. All other community members are required to have an appointment, which can be scheduled by phone at 660.785.6064. For more information, visit vita.truman.edu. 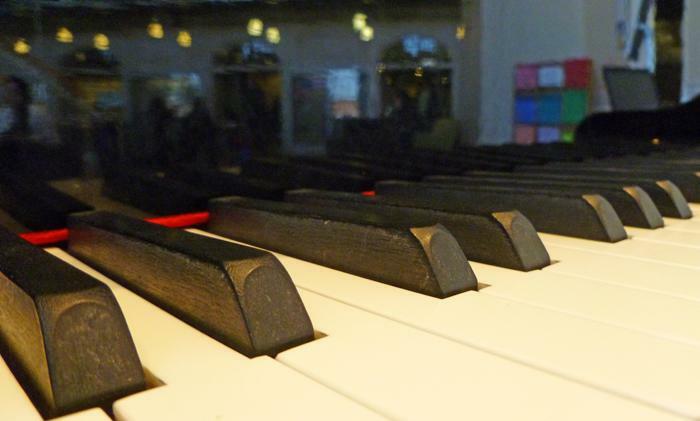 The 35th annual Truman Piano Festival will be Feb. 16-17 in Ophelia Parrish Performance Hall. The festival will feature guest artist Robert Carney. He will perform a solo recital at 7:30 p.m. Feb. 16 that features the work of Bach, Bonds, Copland, Menotti, Prokofiev and Liszt. He will conduct a master class at 9:30 a.m. Feb. 17 featuring Truman piano majors. Both events are free and open to the public. Carney is an active soloist and chamber musician and has performed solo recitals in Europe and several U.S. states. He has degrees from the University of North Texas and Louisiana State University and has studied at the Aspen Music Festival in Colorado. 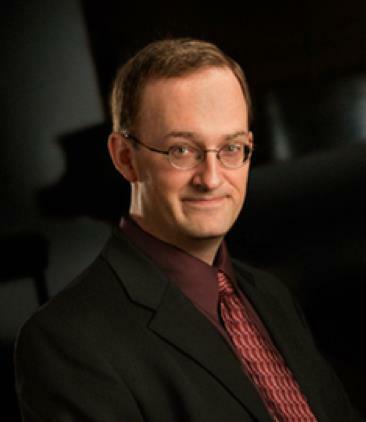 An associate professor of music and chair of the music department at Southwest Baptist University, Carney teaches applied and classroom piano, piano pedagogy, piano literature, chamber music and music appreciation. His students have been prize winners in state, regional and international competitions. His research focuses on web-based instruction for facilitating independent learning, and he has presented his research in Europe, Canada and the United States. In the summers, Carney teaches in the advanced piano program at the University of Illinois in Urbana-Champaign and Blue Lake Fine Arts Camp in Michigan. Active in many professional associations, he is currently president-elect of the Missouri Music Teachers Association. The Indoor Co-Ed Mad Hatter Volleyball Tournament will occur at 1 p.m. Feb. 18 in the Student Recreation Center. Sign-up is done as an individual and names will be drawn randomly the day of the tournament to determine the teams. The cost of the tournament is $5 per person, which can be paid upon arrival, and ages 16 and up are eligible to play. Players should arrive at 12:45 p.m., and the teams will be picked at 1 p.m. Players will be on teams of four to five, and the tournament will start with round robin pool play followed by a single elimination tournament. Registration can be done any time prior to the tournament, including the day of, while spots are available. A pair of indoor shoes should be brought for play. For more information or to sign up, follow the event’s Facebook page or contact Amy Fuller by email at afuller@truman.edu or by phone at 435.230.5232. 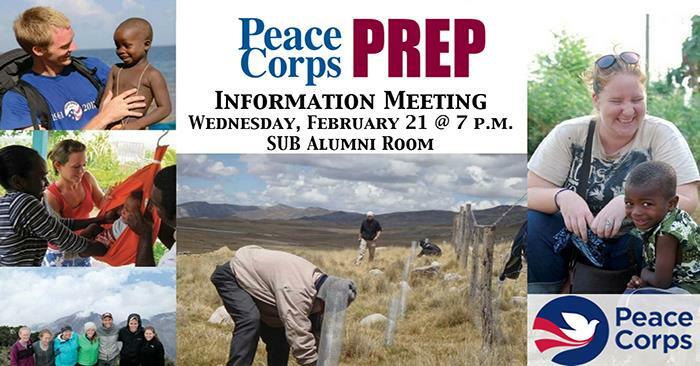 A Peace Corps Prep information meeting will occur at 7 p.m. Feb. 21 in the Student Union Building Alumni Room. 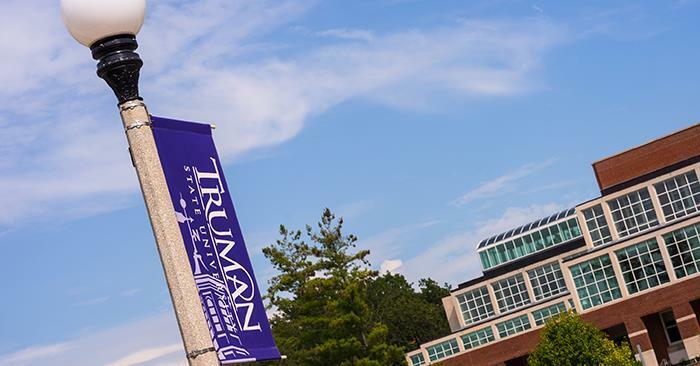 Ranked among the top 20 volunteer-producing midsized schools in the nation, Truman, in partnership with the United States Peace Corps, is able to offer Peace Corps Prep certification. Participants can join the more than 215,000 volunteers who have made a difference in 140 countries around the world in the last 40 years. The Peace Corps Prep program is open to all majors and allows student to complete coursework and fieldwork relevant to international service. Upon successful completion of the program, students receive recognition on co-curricular transcripts and a signed certificate from the Peace Corps. While certification does not guarantee acceptance into the Peace Corps, it gives a competitive advantage in the application process. 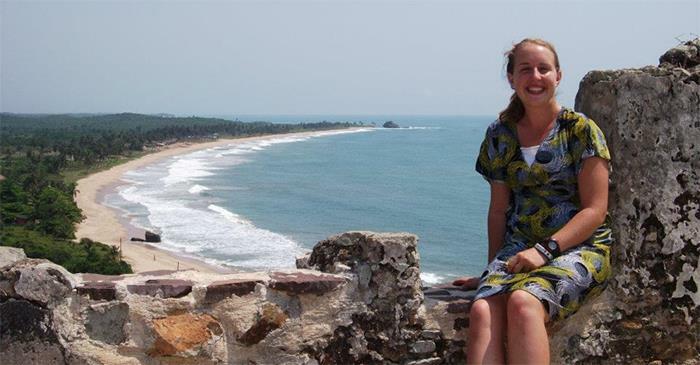 The Peace Corps Prep program prepares students for international development fieldwork and potential Peace Corps service through interrelated coursework, hands-on experience and professional development support. For more information, contact Mary Shapiro or click here. Presentation abstract: Plato, St. Thomas Aquinas, Adam Smith, David Ricardo, Emile Durkheim, Ludwig von Miss and countless other great thinkers have underscored that human beings associate because of material advantages that they derive from cooperation. To understand the mechanisms of inclusion and exclusion, it is therefore necessary to study the cause of association and dissociation. We will focus on the impact of savings and capital accumulation on the one hand and government interventions on the other hand. Hülsmann is a professor of economics at the University of Angers in France and senior fellow at the Ludwig von Mises Institute. He received his Ph.D. in economics and master’s degree in engineering and economic science from the University of Berlin and his Bachelor of Arts in philosophy from the Free University of Berlin. He has taught at Loyola University and Grove City College in the United States and lectured at universities in Argentina, Australia, Belgium, Bulgaria, the Czech Republic, France, Georgia, Germany, Italy, Romania, Russia, Spain and the Vatican. 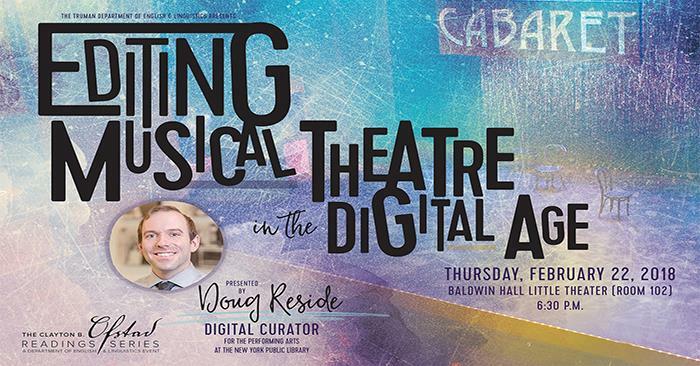 Ofstad visiting writer and alumnus Doug Reside will present “Editing Musical Theatre in the Digital Age” at 6:30 p.m. Feb. 22 in Baldwin Hall Little Theatre as a part of the Clayton B. Ofstad Reading series. Reside graduated from Truman in 2001 with a Bachelor of Arts in English and a Bachelor of Science in computer science. He earned his master’s degree from Truman and Ph.D. from the University of Kentucky, both in English. Since 2011, Reside has served as New York Public Library’s digital curator for the performing arts. In this position, he has initiated, created and overseen a number of digital archive and access projects. Reside also served as product owner for the library’s digital repository, where his leadership helped advance the work of the repository and related services such as the metadata management system and importing data from other bibliographic tools. Sponsored by the Department of English and Linguistics, this presentation is free and open to the public. The front half of the Baldwin Hall parking lot will be closed Feb. 23 for the annual Jazz Festival. Truman, working with the Missouri Consortium for International Studies and Education, offers a unique program for study abroad in Ghana at the University of Ghana-Legon during the fall semester. Located on the Gulf of Guinea in northwestern Africa, the University of Ghana-Legon offers courses from a variety of academic disciplines. Enjoy classes like African dance performance, ancient and medieval political thought, gender studies, governance and leadership, history of Africa, international marketing, sociology of the family, African drumming and many more. 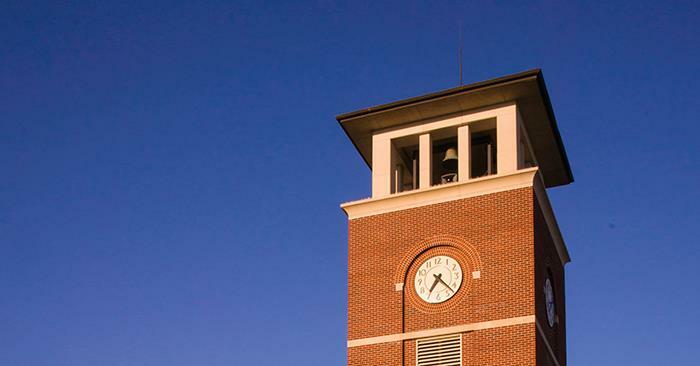 In addition, business students can take business courses exclusively at the School of Business. All courses are taught in English. Along with a wide range of study topics, students will find many other activities to experience the culture of the country. There are campus sports, art, theater and music groups; and a short trip to town offers museums, movies, dance clubs, restaurants, open-air markets and live music performances. For cost information, visit the Missouri Africa Program budget page. Costs include: academic fees (tuition), accommodations, airport pickup, excursions, flight, health insurance and in-country travel. To apply, fill out a Truman online application as well as the University of Ghana-Legon online application. Deadline for the fall 2018 semester is Feb. 23. 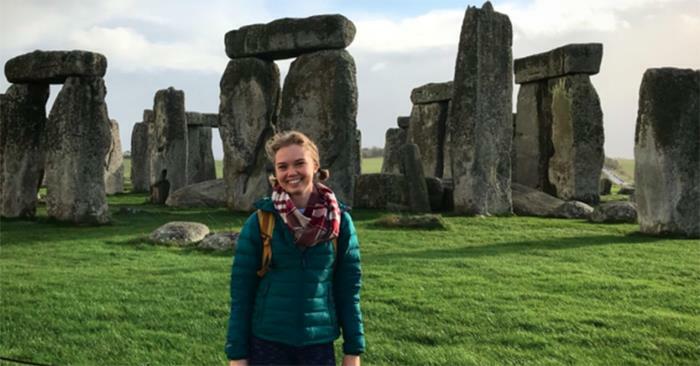 For more information and to apply, contact the Center for International Education/Study Abroad, Baldwin Hall 106, 660.785.4076, ciea@truman.edu. Nominations are open for the Leadership Recognition Program. The awards honor the accomplishments of outstanding organizations and organizational members, advisers and faculty. 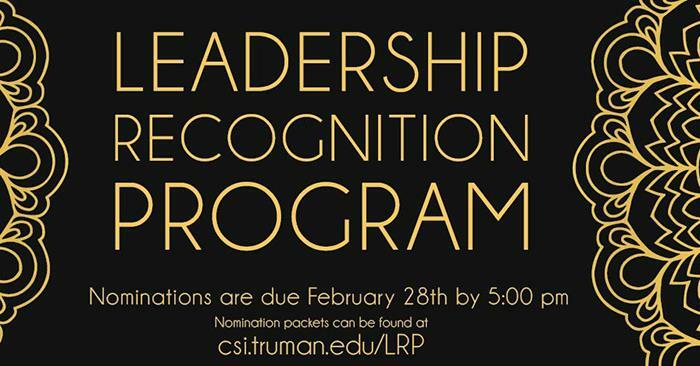 Nominations can be submitted online at wp-internal.truman.edu/csi/leadership until 5 p.m. Feb. 28. 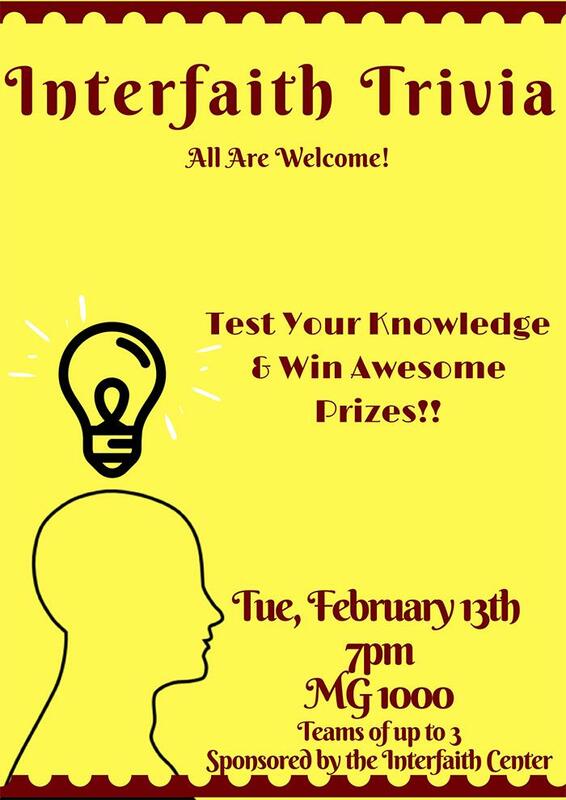 Questions can be directed to Ray Stewart or Bhavana Yerragunta at csilrp@gmail.com. After receiving feedback from recruiters, students and faculty from the fall Career and Grad School Expo, the Career Center has modified the schedule for the spring. The dates for Career Week are Feb. 26-March 2. Monday, the Career Center will sponsor Expo Bootcamp, a workshop that will teach students about networking, professional dress and resumes. Tuesday, the Career Center will host the Etiquette Dinner and SCORE Mock Interviews. The Career and Grad School week will now feature two different expos, one on Wednesday devoted to graduate school programs and the other on Thursday for career and internship opportunities featuring employers from for-profit, non-profit and government agencies. The week will conclude with Interview Day on Friday. The complete schedule of events can be found here. Comments, questions or concerns can be directed to Brandi Wriedt at bkeller@truman.edu or Victoria Soncasie at ucc4@truman.edu. 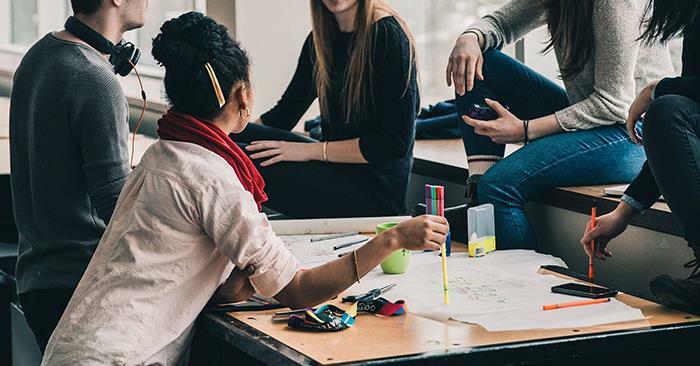 Applicants must be a Missouri resident, typically a 3.0 or higher cumulative GPA, a U.S. Citizen, attending a Missouri public four-year university or the State Technical College of Missouri, and be a sophomore, junior or senior in college. To access more information about this scholarship, click here, or contact the Financial Aid Office at 660.785.4130. The Tillman Scholars fellowship program is open to military veterans and spouses pursuing a full-time bachelor’s, master’s or professional degree at a U.S.-based accredited institution. The Pat Tillman Foundation unites and empowers remarkable military veterans and spouses as the next generation of private and public-sector leaders committed to service beyond self. The fellowship program supports Tillman Scholars with academic scholarship, a national network and professional development opportunities in all fields. The scholarship covers educational expenses including tuition and fees, books and living expenses. In 2018, Tillman scholars can expect to receive an $11,000 annual scholarship as well as a $1,000 stipend for professional development opportunities. Applications are open until 11:59 p.m. March 1. An overview of the program can be found here. To fill out an application or receive more information about the program, click here.